CNC Machined Stainless Stripping Guide. Stainless Snake Guides with Oversized Loop Tip. Machined up Locking Fly Reel Seat. 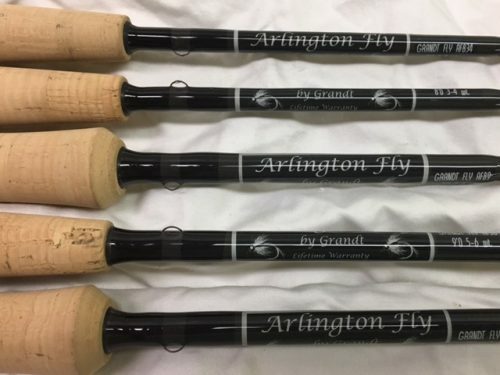 The special release Arlington Fly Series is available during Grandt Industries 35th Anniversary. Each fly rod is comes with a custom machined aluminum case and cloth bag. The limited edition Arlington Fly Series provides a very durable yet sensitive fly fishing experience. The 5 models available are all 4 pieces and are rated between 3 wt. through 9 wt. Arlington Fly Series AF834, four piece 8′ 0″ fly rod rated for 3-4 wt. line. Arlington Fly Series AF945, four piece 9′ 0″ fly rod rated for 4-5 wt. line. Arlington Fly Series AF956, four piece 9′ 0″ fly rod rated for 5-6 wt. line. Arlington Fly Series AF967, four piece 9′ 0″ fly rod rated for 6-7 wt. line. Arlington Fly Series AF989, four piece 9′ 0″ fly rod rated for 8-9 wt. line. Upload your photo using one of our custom rods! Authorized Dealer for Grandt Industries, the industry's innovative USA custom fishing rod manufacturer. Authorized Reseller for Radtke's Pike Minnow Co., a manufacturer of countdown lures.